Stuck in a Skin Care Routine That’s Not Working? It’s Time to Change It Up! This month at Azura, we are all about trying something new – and getting rewarded for it! Take a step out of your comfort zone and keep reading for specials on BOTOX ®, BBL, NEOCUTIS, and more! Considering BOTOX® for the First Time? Have you wondered if Botox® Cosmetic is right for you and haven’t tried it before? Now is the perfect time! 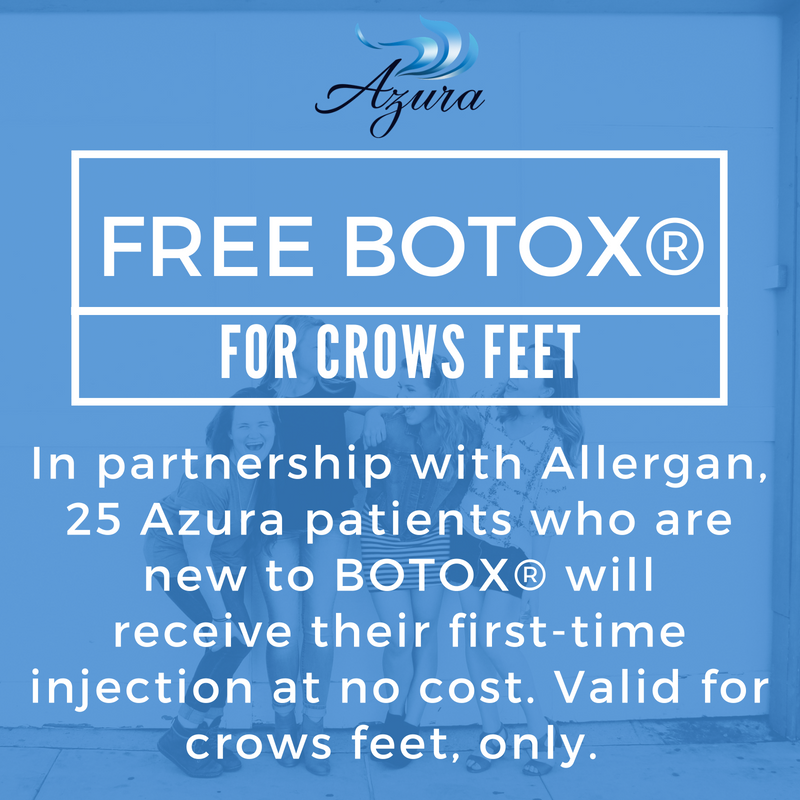 Azura was chosen for a partnership promotion by Allergan, the maker of BOTOX® Cosmetic, to inject twenty-five FIRST-TIME BOTOX® patients or patients that have had BOTOX® but not in the crows feet area, at no cost. This promotion is free for the crows feet area only. PS: You can add on Microdermabrasion or Dermaplaning treatment for just $50. Feel left out because you’ve done it before? ☎️ Call us for a special offer for our returning clients: 919-307-8033. When was the last time you took a good look at your skin care routine? 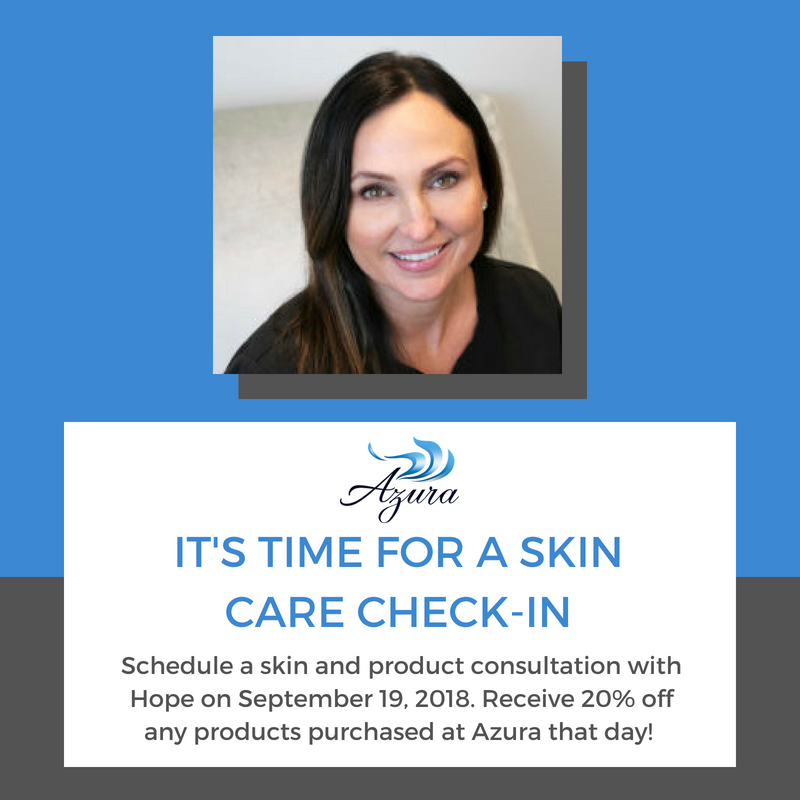 Let Hope help you figure out what is best for your skin and what changes you need to make to prepare for the cooler weather. 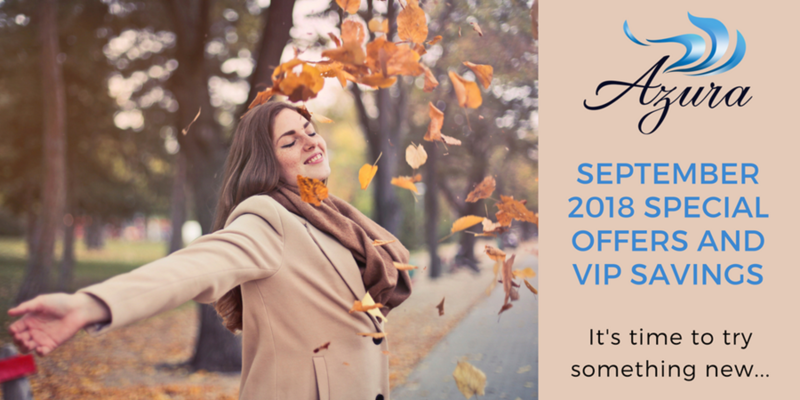 Bring your current products with you, and if you are ready to stock up for fall, receive 20% off any products purchased at Azura that day. Microblading: Last Month to Save! Don’t let this month’s special offer pass you by! Our introductory rate of $500 (regularly $600) is ending September 30, 2018, so book this month to save! Your old permanent makeup doesn’t have to be permanent! 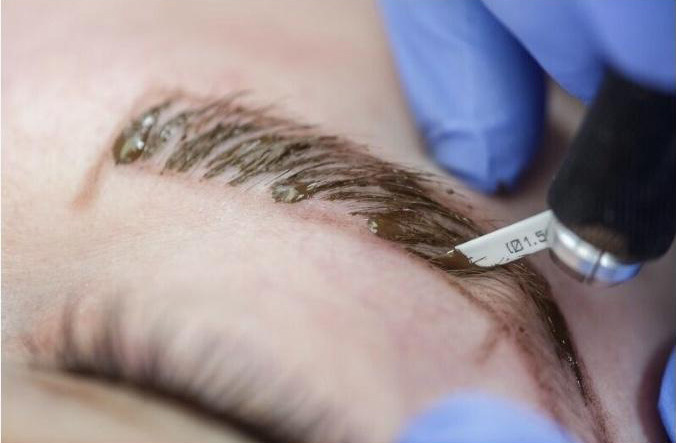 Is the microblading or permanent makeup you’ve done in the past now unwanted? We’re excited to announce that we can remove permanent makeup! Salt/saline is the most effective method of removal and doesn’t harm the hair follicle like laser treatment sometimes can. 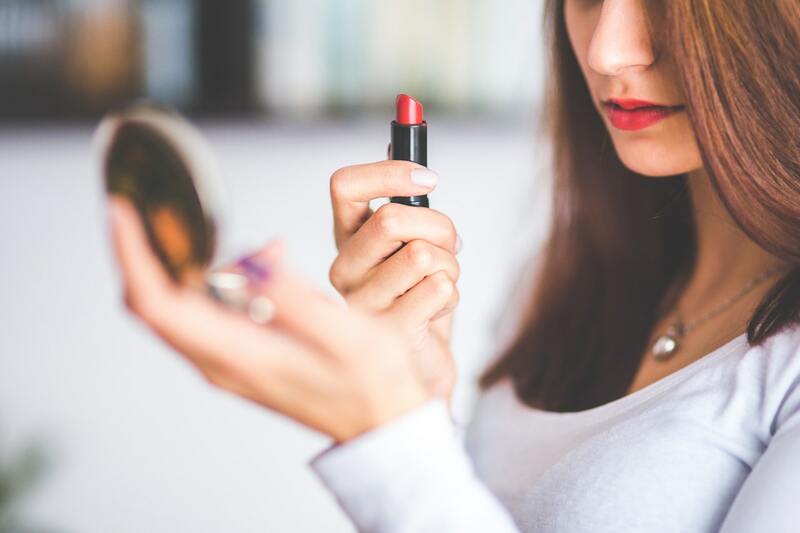 Every client treatment plan is different and unique depending on many factors such as the age of permanent makeup, type of pigment used, color of pigment used and each client’s own healing response. Along with our NanoLaserPeel special offer running through the end of September, we are introducing another treatment with our new Sciton Joule: BBL! 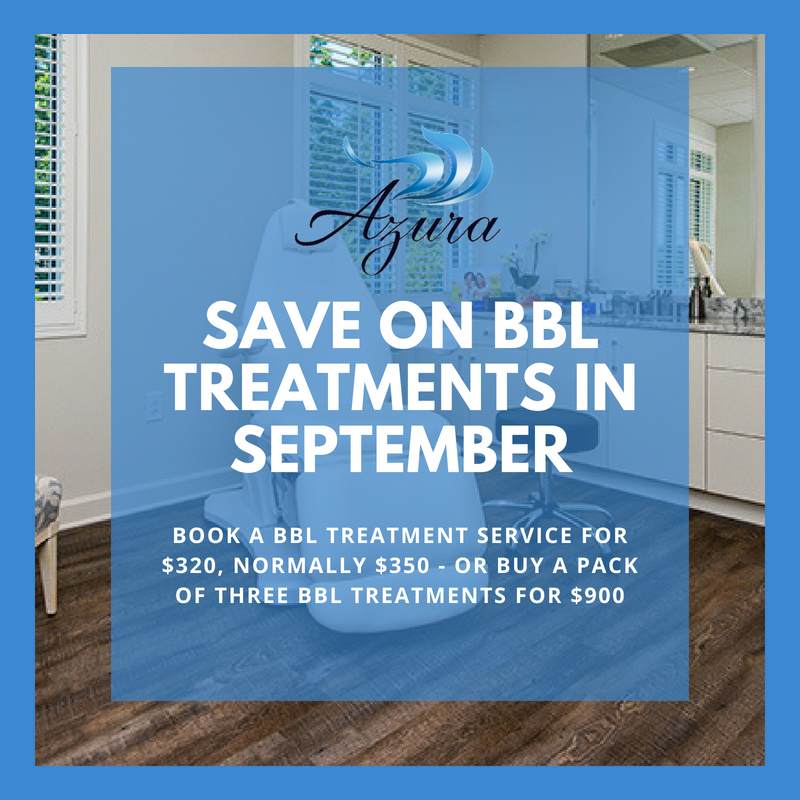 In September, book this service for $320, normally $350 – or buy a package of three BBL treatments for $900. Love NEOCUTIS as much as we do? This month, save when you buy and save big when you buy more! Save 10% when your purchase one NEOCUTIS product. Save 20% on two NEOCUTIS products. Save 30% on three NEOCUTIS products. Authentic NEOCUTIS skin care products are available exclusively through certified and participating medical practices and skin care providers – you won’t find these products at a drug store or behind the beauty counter. BONUS: Be sure to download the NEOCUTIS Swiss Rewards app to enjoy more savings on your future purchases!